I have to confess that I don't normally go out of my way to attend new music concerts, having listened to enough ear-bending endurance-test experiments in music school to make me wary. I tend to think it's more fun to play new music than to listen to it. Likewise, it was a tough sell to get my husband Robert to go to Disney Hall with me on Tuesday, despite the fine reputation of the Los Angeles Philharmonic's Green Umbrella Concerts, established in 1982 to perform and promote new works by contemporary composers. 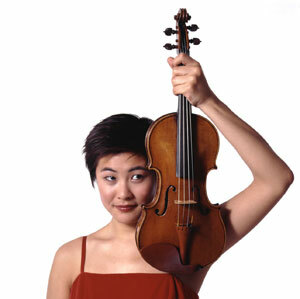 I sought out tickets because I was interested in hearing violinist Jennifer Koh play live, seeing composer John Adams conduct and generally enjoying the fine musicianship of the LA Philharmonic's musicians, whatever they happened to be playing. The evening featured three world premieres, by composers Missy Mazzoli, Gabriel Kahane and Andrew Norman, and also a work by Steven Mackey. We'd see what happened. As we sat down, Robert started to read the program notes. "The d-minor chord spins into an off-kilter series of chords that doubles back on itself, collapses, and ultimately dissolves in a torrent of fast passages," he quoted, raising an eyebrow. He turned the page. "It's messy, and fragmented, and it certainly doesn't get things right on the first go-around," he read. His eyes jumped around, his expression growing more and more skeptical, "slightly manic...it crashes...arrhythmic...satanic harmonies...Laurie!" "Stop reading, just sit back and take it in," I said, talking as much to myself as to him. Looking around, I noticed that this concert had attracted a very respectable crowd – with more than 1,400 people in attendance, as I later learned from publicist Lisa White at the LA Phil. That's an impressive gathering to support new music. The lights dimmed (to green – "Green Umbrella," remember) and out walked the legendary composer John Adams – white-haired yet youthful, dressed casually and completely at ease. 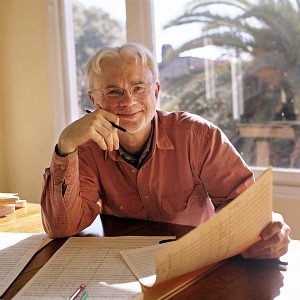 He noted that three of the evening's pieces were world premieres, which "are fraught with anxiety...and ecstasy...and anxiety...."
Typically, when a composer hears his or her work played for the first time, at the first rehearsal, "nothing sounds the way you want, and you blame yourself," Adams said. "You really think you've written junk, and you have to surrender all sharp objects until the next rehearsal." But then things start coming together, particularly in the hands of musicians with fast learning curves, like those in the LA Phil. Adams noted that Disney Hall, with its modern Frank Gehry design, inspires a sense of the new and makes a composer want to reach into the future – there's no larger-than-life portrait of Beethoven glaring over your shoulder. He introduced the first piece, "Dissolve O my Heart" by Missy Mazzoli, as being a piece for solo violin, based on Bach's Partita in D minor, "A pretty awesome undertaking," Adams said, "I would never try to write that kind of piece!" Many violinists understand this sentiment – the Chaconne from the D minor Partita is one of the most revered works in the violin repertoire; it has an almost sacred status. Jennifer Koh took the stage to play this work, poised and elegant in a red evening gown. The first chord of the piece matched the first chord of the Chaconne – note-wise. But that's about all the pieces have in common: the first chord was only a point of departure. Instead of the grand entrance that it makes in the Chaconne, in this piece the chord was quiet and arresting, smooth as can be. Then the pitch bent like a rubber band, with glissandi taking it up and down the fingerboard. The piece didn't seem to stray very far from that first chord, harmonically, it was chordal and punctuated with open-E notes. Jennifer put a lot of energy and muscle into the performance, yet with extreme control and steadiness. Next came "Orinoco Sketches," for which the curly-haired composer, Gabriel Kahane, emerged wearing red skinny jeans and a black blazer to play piano, guitar and sing along with a 15-instrument ensemble comprised of strings, woodwinds, brass and percussion. The piece is named for the boat that carried Gabriel's grandmother, Hannelore Kahane, from Hitler's Germany to Havana, then to Los Angeles. I enjoyed the piece, which seemed to come from a true place of inspiration and incorporated both a popular and classical sense of new music, which put it on accessible ground. He adapted entries from his grandmother's diary to create the text for a song cycle. The beginning truly sounded like troubled waters with some echoes that reminded me of Kurt Weill – quirky but tonal. Earlier, Adams had aptly described Gabriel's voice as that of an "urban balladeer." The music went continuously from one song to the next; when he wailed ,"Havana!" I knew we were there – and sure enough a swirl of Cuban-flavored sound and gesture emerged around his song. There was plenty of meter change to keep Adams on his feet. Gabriel took up his guitar for the final part of the cycle – he played a tonal ballad as an increasingly chaotic orchestra overwhelmed his song, which at last ended with poignancy and his grandmother's words, "How do you calculate a California sun against a war that's only in the papers...Do you feel it at all?" The composition "Try," by Andrew Norman, was most like the kind of traffic noise I expect of new music, only what made it fun was that it had a sense of humor. I'll also say here that every piece of the evening benefitted from the fact that John Adams fully embraced it and made a genuine effort to bring it to the audience in an understandable way. The star of "Try," (named for the composer's trials with music) had to be the percussion instrument that made a sound, almost like running a stick over a washboard, and I believe it was a guiro. Now and then, all noise would abate to reveal this funny little wooden taunt, like blowing a raspberry, and the audience literally laughed each time. A few other effects included a rather gastric background noise, made by scraping the bow sideways. Near the end, amid much chaos, Adams gestured to the piano, as if to present a few quiet notes. Slowly everything died down, leaving just the piano, to play a few notes, which evolved into a small cascade, then chords – becoming so quiet that no one could swallow, then ending. At last came Steven Mackey's "Four Iconoclastic Episodes," for electric guitar, violin and small orchestra, which Adams described as "a kind of Concerto Grosso for Hell's Angels." Mackey played the electric guitar, and Jennifer came back out and played violin. My favorite episode was called "Salad Days," which actually began in an unexpected way, with Mackey's guitar crashing to the floor! But no matter, I unthinkingly noted that this movement had "pizzazz" and then I wondered at the choice of words, as this movement incorporated every kind of pizzicato possible: quiet rumbly four-finger strumming, guitar-style strumming on fiddles, traditional pizzicato with the violin up, Bartok pizz, you name it. It was clock-like, with lot of little mechanisms all working in precise time; and all the while, the solo violin was a smooth counterbalance. During the climax of a movement called "Lost in Splendor," Jennifer's violin (the highly awesome-sounding 1727 ex-Grumiaux ex-General DuPoint Strad) went down for the count – with either a broken string or collapsed bridge, I'm not sure which, and this led to a great exchange of fiddles, Jennifer traded with the concertmaster, who traded with third chair, who traded with fourth chair, who carefully babysat the valuable fiddle for the rest of the piece. The volume dropped a bit, but Jennifer's octaves were no less in-tune, no less smooth than they were before the handoff. At the conclusion of the concert, Robert said it best, in the honest way of a non-musician: "I liked that a lot better than I thought I would!" 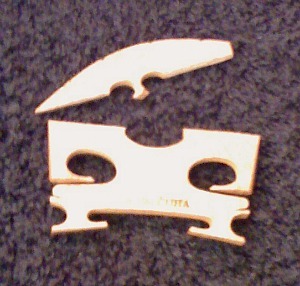 "Just in case you were wondering, I attached a picture of the reason I had to switch fiddles! I took it backstage after the fiddle players in the Phil gathered up the pieces for me. It's on my facebook page too.... I've never had this happen! I've never seen this happen before! CRAZY!" Fascinating review Laurie, wish I'd been there. Lovely writing Mrs. Niles, kinda made me feel like i was there just a bit, brought a big smile to my face. Must have been a reall nice event. Sounds very interesting, although I am not sure I would have liked most of it. However, even very good musicians could have had the same "honest" reaction as Robert. This sort of reaction is not necessarily limited to the "non-musician." Wonderful review. I've had the chance to see Jennifer Koh perform and John Adams conduct, but not at the same time. As someone said before me, your writing is so lively I feel as if I were there! "It was comforting and also surprising to read about all of your members' bridge mishaps! SO, I wanted to offer some advice to any of your readers that might encounter this situation in the future! Through the help of my friends in LA, I managed to track down and wake up a well-respected luthier in California. (The concert did end after 10 pm so I couldn't call my luthier in New York as it was after 1 am!) He advised me that one should remove the strings AND tailpiece from the top. You might have noticed this in the concert, but before I handed my fiddle over to the concertmaster, I loosened all the strings on the fiddle. If anyone's bridge falls down or cracks, one should do this immediately to relieve any tension on the top that remains. I've included a picture of how one should pack up the fiddle safely to take to their luthier after something like this happens. I also added a towel on top to create a cushion with the air suspension pads in the case so the fiddle won't be moving around in the case. I'm offering the same advice on facebook!! !